65% of people don't trust her, so how is she doing so well? Only 30% say they do. Would you marry someone you didn't trust? Would you let someone you don't trust drive your car? Have access to your bank account? Babysit your kids? So Why Would You Trust Her To Be President? You mean besides the "missing $6B" while She was the Head of State? Which turd do You like better? Don't You flush the whole thing down? June 23: "A feature-length cut of the movie, retitled The Innocence of Bin Laden, was shown exactly once, to an audience of fewer than 10 people, at the Vine Cinema, on Hollywood Boulevard." www.vanityfair.com... "The words “Muhammad” and “Islam” never appeared in the screenplay—but they were dubbed in, front and center, in a feature-length cut of the movie, retitled The Innocence of Bin Laden" www.thedailybeast.com... July: “Muhammad Movie Trailer” (English) to uploaded to youtube. "The clip attracted no significant attention until the beginning of September, when an Arabic-language version of the trailer appeared on YouTube." www.vanityfair.com... September 4: “Muhammad Movie Trailer” (Arabic) to uploaded to youtube. 'Whatever his name is' (the insane filmaker) claims he has no clue who made that print. September 8: “Muhammad Movie Trailer” "was all over Egyptian religious television—with its crude sexual jokes about Muhammad being gay and interested in “dominant or submissive” coitus with little girls and prostitutes—and bedlam erupted in the Middle East, with as many as 50 deaths recorded." www.thedailybeast.com... Between 9/8-9/11: Muslim Brotherhood calls for protests. "﻿ The liberal Democratic Front Party called on Morsi to postpone his visit to the United States, scheduled for later this month, in protest of the video." www.thenation.com... Protests / riots raged on past 9/11 (Tuesday). "Several al Qaeda-linked jihadists helped incite the protest outside the US embassy in Cairo on Sept. 11. The jihadists include senior members of Egyptian Islamic Jihad (EIJ), a group that merged with al Qaeda, and a senior Gamaa Islamiyya (IG) leader who has longstanding ties to al Qaeda’s senior leadership. ...Mohammed al Zawahiri (brother of al Qaeda emir Ayman al Zawahiri) admittedly helped stage the Cairo protest." www.longwarjournal.org... September 10: Ambassador "Stevens arrived in Libya on Sept. 10, he had no idea how bad things were regarding the state of security." 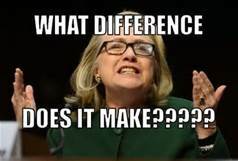 conservativetribune.com... September 11 (9:40PM): Benghazi "Embassy" attack begins. "These notifications were quickly transmitted from the Department of State to the Department of Defense (3:40 PM EST). DS headquarters maintained open phone lines with the DS personnel throughout the attack." fas.org... September 11 (10:04): Six security personnel and a translator left the Annex en route to the facility. Stevens presumed dead by now (and left for dead). September 12 (evening): Support platoon arrives; Banghazi Crisis ends. September 13: The ""peaceful" protests" still ongoing. 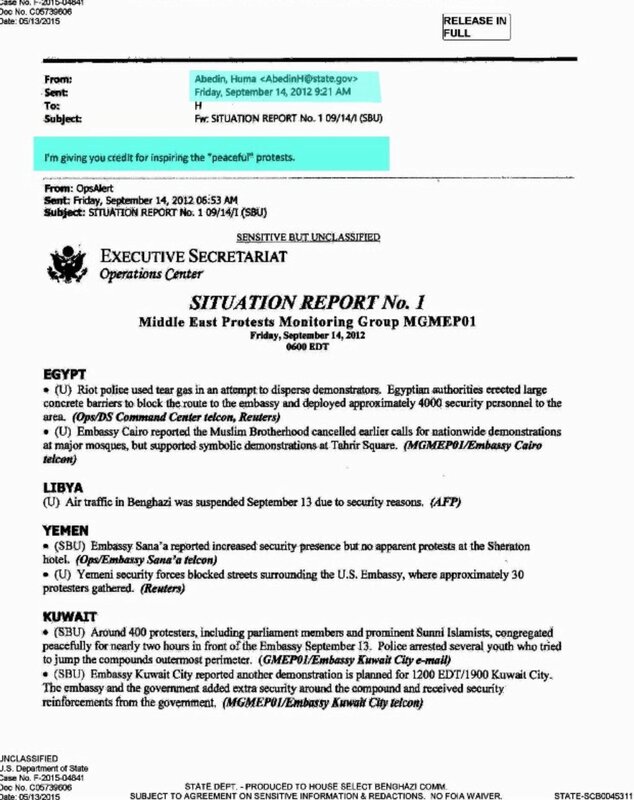 September 14 (6:53AM): Huma emails "H" to give credit for "inspiring the "peaceful" protests". February 2014: Retired 4-star admiral: Benghazi was an Obama false flag that went wrong "In an interview with Lou Dobbs on the Fox Business Network., Adm. Lyons says that Barack Obama intentionally conspired with America’s enemies to stage a bogus attack on the U.S. compound in Benghazi, Libya, and the bogus kidnapping of Ambassador Chris Stevens. According to the plan, Obama would successfully “negotiate” for Stevens’ release in a prisoner exchange, which would bolster the POS’s then-mediocre approval ratings just prior to the 2012 election. In Lyons’ words, “The attack on the American Consulate in Benghazi . . . was the result of a bungled abduction attempt . . . the first stage of an international prisoner exchange . . . that would have ensured the release of Omar Abdel Rahman, the ‘Blind Sheik’.”" 2016: The memo by Huma Abedin is leaked. Or how about the how the Clinton's pardoned the FALN terrorists who ran a bombing campaign on US soil? Want to be Pardoned as a Terrorist? Go Communist & Vote Hillary! Better yet how the Clinton's are deep operatives in the CIA's global Drug + Jihad Empire? I simply cannot stand the woman. Loathe her to be quite honest.....she's a power hungry cheat of a human being. Because she is longtime close friends with the Bush Family and the Saudi "royals." at least your being honest, and not using regurgitated lies or slurs.